The Caterpillar stand…the world’s biggest plant manufacturer at the world’s biggest show. The greatest show on earth – and bigger than ever – kicked off in Munich with 3,700 exhibitors prepared to welcome what organisers believe could be a record 600,000 visitors. 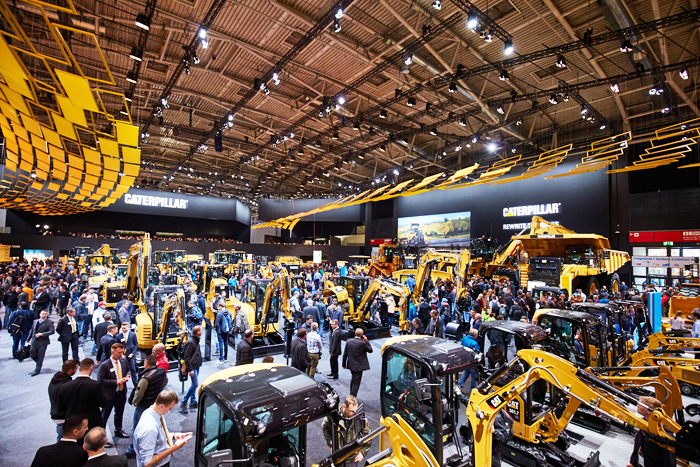 Bauma 2019 will, according to organisers’ spokesman Klaus Dittrich, be “gigantic” and the biggest in the trade fair’s history. 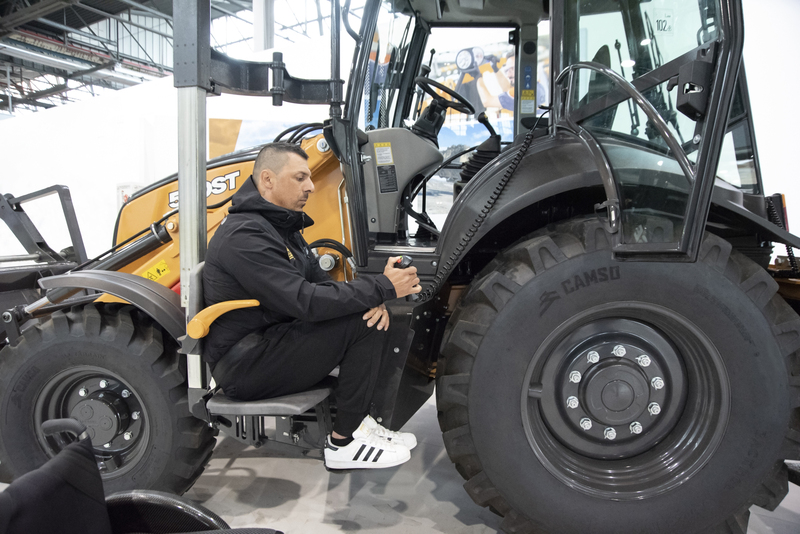 First exhibitors began creating their stands last November and a fleet of more than 13,000 trucks and 600 other heavy vehicles has been handling the machinery and equipment that has poured in from around the world. “What we will experience in Munich during these seven days will be amazing,” promised Dittrich. Scottish Plant looks at some of the early news from week-long extravaganza. Updates and photographs will continue during the week. Liebherr is in confident mood after announcing this week that it has broken through the €10 billion turnover barrier for the first time in its history. Revenues from the construction machinery and mining equipment divisions rose by 10.8 % to €6.83 billion. As ever at Bauma, the German manufacturer leads the way with a colossal 14,000 m2 outdoor stand populated by more than 60 exhibits, among them its new generation of crawler excavators which started coming to market in the first months of this year. In the first phase of the launch programme seven models are being released in the 22- to 45-tonne range. Other big attractions are the new XPower large wheeled loader with rear bystander detection and built-in tyre-monitoring system, and the Ultra-class mining trucks and excavators. 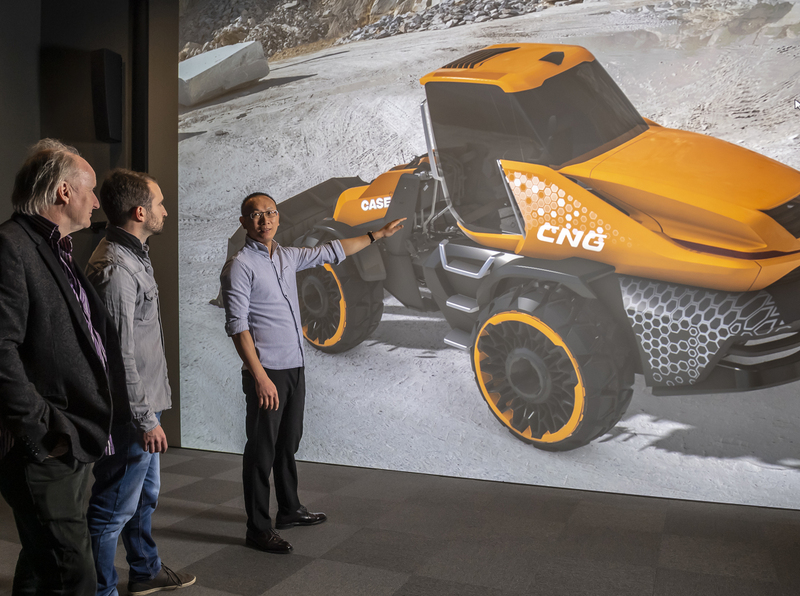 CASE Construction Equipment is showing a prototype of a backhoe loader that can be accessed and operated by drivers “of all mobility levels”. The external seat being moved. A critical factor in the development was that the accessible elevator attachments be easy to use. The operator approaches the cab door, on which is attached a pair of joysticks that control an external seat. The joysticks are used to manoeuvre the seat into place next to the operator and the operator then transfers into the external seat and uses the joysticks to be elevated into the cab. The seat used to access the cab then returns to its starting point and the operator can begin working. The machine can be further enhanced with hand controls inside the cab, allowing operators who are unable to use foot pedals to still take full command. The technology can be extended to a wider range of machines. Virtual 3D modelling of the loader. Elsewhere, CASE is revealing the world’s first wheeled loader that runs entirely on alternative and renewable fuel. ProjectTETRA includes a methane-powered engine, specially designed and developed by sister brand FPT Industrial for construction applications. With a maximum 230hp, it delivers the same power and torque as its equivalent diesel engine found in CASE’s 821G wheeled loader. Bauma is the first big event since Volvo Construction Equipment announced it was going electric on its compact excavators and compact wheeled loaders in 2020. The first two hydraulic-electric machines are unveiled in Munich before a market-by-market introduction. Excavators are the stars of the Volvo line-up this year with launches for the 20-tonne EC200E and EC15-EC20E compacts that are sharing the limelight with the EC750E high-reach demolition model. There are also the “game-changing” EC300E hydraulic-hybrid and an EC220E units. There’s a total of 50 machines spread across Volvo’s two stands, supported by a mini-film featuring Hollywood star Dolph Lundgren, Operators’ Club competitions and live action displays of the Dig Assist system and attachments. Caterpillar lines up alongside German dealer Zeppelin Baumaschinen to show 64 machines, 20 of them new introductions. It’s the biggest collection of new products Cat has ever introduced at Munich and embraces the D6 XE, the world’s first high-drive electric dozer and a series of wheeled loaders in a variety of configurations to suit various applications. A magnet for visitor ‘selfies’ is the new 90-tonne 777G rigid truck with new-look cab while articulated trucks are represented by the completely redesigned 730, weighing 22% less than its 730C predecessor. A D8T dozer remote-control station is also attracting interest. With multiple levels of remote control and even semi-autonomous operation, Cat Command is available in two configurations – an over-the-shoulder console or remote-operator station which give operators full control of the dozer without being exposed to site hazards. 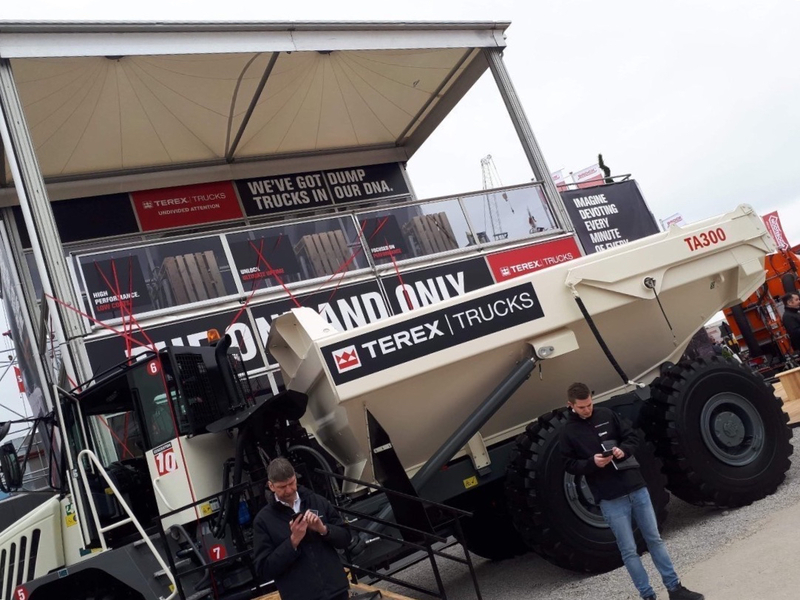 Terex Trucks’ recently-updated TA300 articulated hauler makes its first international trade show appearance at a time when the Motherwell manufacturer says the business “is the strongest it’s ever been”. Danish equipment manufacturer Hydrema has launched a dumptruck to comply with UK safety regulations. The UK is the world’s largest site dumper market and in recent years operators and contractors have led a drive to reduce site accidents. 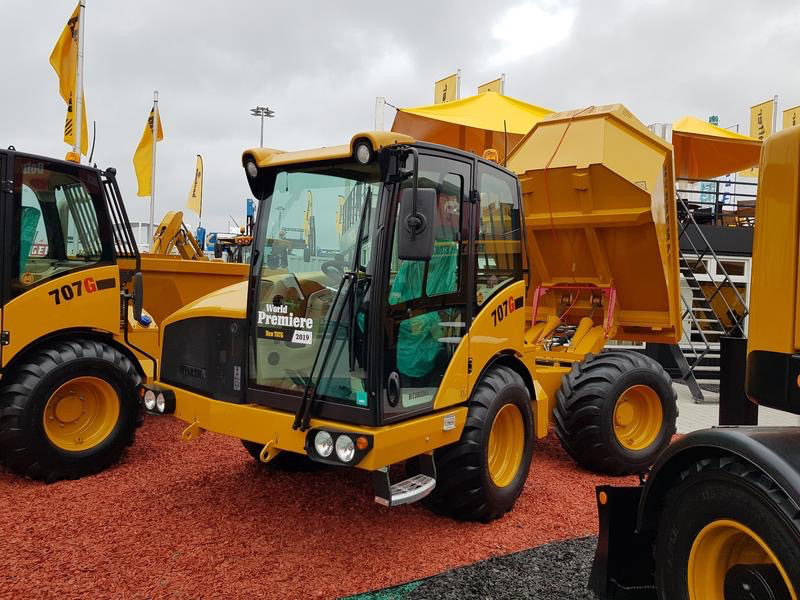 Hydrema has responded with a small dumptruck, a scaled down version of an articulated machine but in the 7-tonne class that it claims offers all the benefits of a larger rear-tip ADT but with the compact dimensions of a traditional dumper. Unladen weight of the 707G is 5.3 tonnes, and load capacity is 6.5 tonnes. Speeds up to 34 km/h are available and the cab is ROPS and FOPS. Hyundai Construction Equipment Europe (HCEE) has 15 equipment products on display, six of them brand new in Europe. Latest additions include the one-tonne HX10 A and the 8.5-tonne HX85A CR – long-anticipated additions to the compact excavator range – which are joined by the latest Stage V excavators and wheeled loaders. The new HX900 L excavator, designed specifically for the European construction and quarry sectors, replaces the R800LC-9 and is the second biggest in the range, sitting behind the 120-tonne R1200-9. At the last Bauma in 2016 Bobcat showed a prototype of its E10e one-tonne electric mini excavator. This time it’s launching the commercially-available version. A zero tail swing model in the one tonne class and just 72cm wide, it can pass through standard doors and in and out of lifts, making it suited to indoor applications such as demolition and basement construction. By coupling it to an optional external super-charger while operators are on normal work breaks, the E10e can operate for a full eight-hour working day. Elsewhere, the company’s products are distributed across various zones to showcase its materials handling, earthmoving, roadworks, landscaping and demolition capabilities. The new E27, E34 and E35z R-Series mini-excavators form the core of the Earthmoving Zone where they are seen alongside the T450 compact track loader. Doosan Construction Equipment has a raft of products making debuts. There are new minis, a 25-tonne material handler, 30-tonne and 80-tonne excavators and Stage V articulated trucks. Three wheeled loaders are being shown for the first time at Bauma. The new Stage V compliant 2.7 tonne DX27z and 3.5 tonne DX35z zero tail swing (ZTS) models underscore Doosan’s range of minis. “As a true ZTS machine (even with the optional heavy counterweight), the DX27z offers the highest flexibility of movements when working close to walls, coupled with best-in-class 360° stability and a low weight for easy transportation,” a spokesman says. The DX35z is a new generation model in the 3.5 tonne class offering the benefits of ZTS. “This excavator provides the best possible mix of compactness, a large operating range for the workgroup, great stability and a large and comfortable operator area,” the company adds.